This website is an information and community resource for trail runners and ultra runners of all abilities and levels of interest. 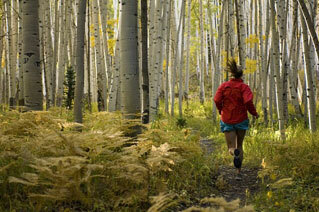 You can contribute races, enter race reports, and participate in the trail running forum. Read more about this site here. - If you're new to the idea of trail running, or for a re-validation of why you should keep at it, read this short "ode" to the joys of running the backcountry. Article: Blister Free Long Distance Running - Cathy Tibbetts explains step-by-step how she runs ultra-marathons without getting any blisters. Chad Zummach on the Primitive Trail near the Windows. Arches National Park, Utah.